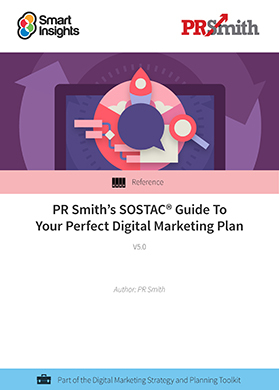 How will PR Smith's SOSTAC® digital marketing planning guide help me and my business? Knowing where to start can be the toughest part when creating a digital marketing plan or a wider-scope marketing plan for the first time. By using PR Smiths' SOSTAC® model you will have a clear structure that makes it quicker and easier to create the plan. More importantly, the beauty of the SOSTAC® structure is that when you present your plan to colleagues or clients, they will just get it. But, don't just take our word for it. The Chartered Institute of Marketing centenary poll voted SOSTAC® in the Top 3 Business Models worldwide. It's an established technique developed through the 1990s by PR Smith for structuring business and marketing communications plans, here adapted by its author specifically for creating a digital marketing plan. Many Smart Insights members will know PR Smith’s SOSTAC® planning model which we have featured regularly in our blog posts, infographics and other premium member downloads. We reference this planning framework regularly since we think it’s a superb tool for creating and communicating plans with clarity. That’s all types of plans from business plans, through marketing plans to digital marketing plans. It works across all of these since everyone who sees a plan structured using SOSTAC® ‘just gets it’ and can quickly move to discussing how best to improve the plan. When we speak to our members, many mention SOSTAC® as being really useful for structuring plans, so we talked to Paul about collaborating to create a guide applying it to online marketing planning and it’s now available to download by Smart Insights Premium members. In each section Paul blends explanations, examples, tools and checklists to help you learn how to apply it. Paul runs workshops, advises and mentors as well as writes books about digital marketing. Someone once told hm that there were 17,000 Paul Smiths in the UK alone, so with his initial being ‘R’, he adopted PR Smith as his pen name. His five books are published in seven languages. US Online marketing legend Jim Sterne refers to Digital marketing Excellence 5th Edition (co-authored with Dave Chaffey of Smart Insights) as ‘a must read’. The CIM refer to Marketing Communications 5th Edition as a ‘Marketing Major’. While SOSTAC® Planning is voted in the top 3 marketing models worldwide. See Paul’s site PRSmith.org for information about his other books and his other passion, The Great Sportsmanship programme.